Oh trends, we all seem to get pulled into them right? They're just so tempting! 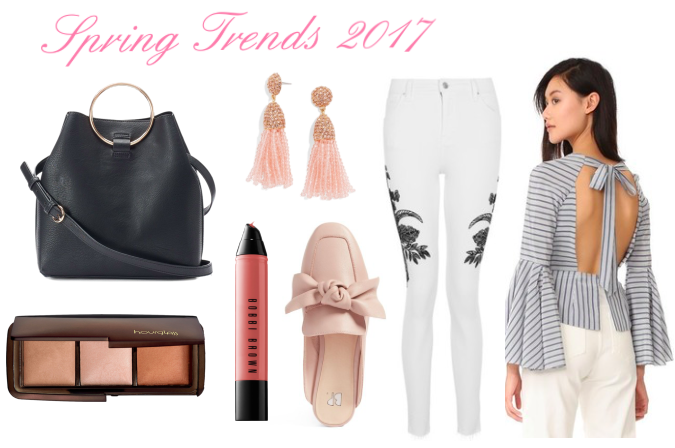 This year, spring trends seem to especially be tempting for me since everything is so feminine. I'm talking ruffles, bows, and everything blush pink! I decided to round up some of my favorite trendy pieces which we could all use to refresh our wardrobe for the new season. First up is this embroidery jeans from Topshop which for a pair of jeans, looks so elegant! I'm also loving this open back top from Milly since stripes are here to stay again for the spring/summer. Plus how cute is that bow?! Speaking of bows, you might've seen my bow mules over on Instagram and I linked the leather version here which is comfy enough to wear everyday. As for accessiores, I also posted on my Instagram this handbag which comes in cream and reminds me of the 90's. Also I'm going through an earrings phase right now and I'm totally dying to get these earrings from Baublebar! Lastly for makeup, glowy skin is in for the spring and I've been looking into getting this highlighter palette from Hourglass which gives a gorgeous, natural finish. And I had to include the new Bobbi Brown art stick which comes in liquid form now! I already own the lip crayon art stick and use it almost everyday but have to invest in these new ones! What are you loving for spring? Let me know below!